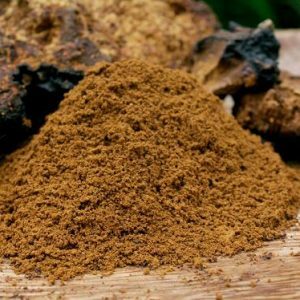 Chaga is an amazing medicinal mushroom that grows in cold climates located primarily in Siberia, Asia, Eastern Europe and parts of North America. Brew as a tea for centuries in folk medicine, chaga mushroom is now available in a variety of easy to use forms. The word “chaga” comes from the word for mushroom in the Komi-Permyak language of the native peoples in the Kama River Basin just west of the Ural Mountains, in present-day Russia. Today, chaga mushroom goes by many different names. 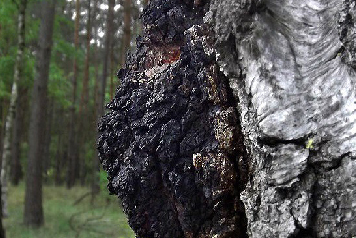 The scientific name for chaga is Inonotus obliquus, while many of the common names include black mass, cinder conk, clinker polypore, birch canker polypore and even ‘Sterile Conk Trunk Rot of Birch.’ People call it “black mass” because of its dark color; the terms ‘cinder’ and ‘clinker’ refer to the mushroom’s appearance, which closely resembles burnt charcoal. Many of the other names reflect the fact that the mushroom typically grows out of the trunk of birch trees. Many people call chaga mushrooms, “King of Herbs” or “Gift from God.” While chaga is a fungus and not an herb, it is certainly nature’s gift of wellness to the human body. Chaga mushroom grows primarily on birch tree. Unlike some mushrooms which are fleshy and porous, Siberian chaga mushrooms are almost wood-like in its structure, with thousands of tiny mycelium stretching outward from the central core. Chaga begins life deep inside their host trees when chaga spores infect the tree’s heartwood and start spreading outwards. As the fungus grows, its dense mass begins pushing towards the outside of the tree. The mushroom eventually erupts through the bark and the tree develops a canker. Over time, the canker grows and hardens into a large black mass, known as mycelia. The first round of chaga can be harvested from the tree 3 to 5 years after the initial infection. By this time, the mycelia is quite large, measuring anywhere from 9 to 16 inches (25-40 cm). The outside of the mycelia, known as the sclerotium, is hard, deeply cracked and black in color. The interior has a granular appearance and has a rusty yellow-brown color with white- or cream-colored veins. Trees live with chaga mushrooms for decades. Well-developed chaga mushrooms can be found on 40-year-old trees. Harvesting the mushrooms does not kill the tree and it does not stop the infection, so both the tree and the mushrooms will continue living well after the first harvest. 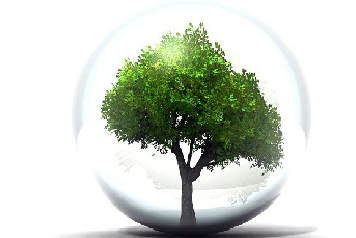 The mushrooms will grow again, so subsequent harvests can occur every 3 to 10 years until the tree dies. Chaga mushrooms grow in very cold habitats and primarily from the trunks of birch trees, which many regard as an important source of healthful ingredients. In fact, WebMD notes that the leaves of birch trees “contain lots of vitamin C” and are used to make medicine. Birch trees are plentiful in Eastern and Northern Europe, particularly in Russia, growing along the banks of pristine rivers and streams. 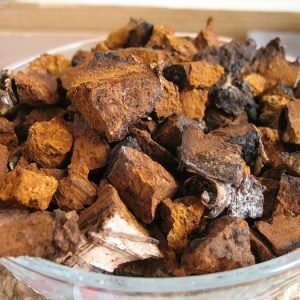 Chaga has many characteristics that make it unique in the fungus world. Most mushrooms reproduce by making spores, which they then forcibly eject into the wind – somewhat like seeds from a dandelion. As chaga matures, it develops a fragrant, spore-producing sheath around its mycelium. Spores drop through the pores of the sheath then quickly disappear as beetles and flies gobble up the spores or carry them to other trees. Chaga mushrooms are even different from other tree fungi. Most tree fungi sprout on the outside of trees, so the mushrooms absorb very few nutrients from the interior of the tree. Chaga mushrooms, on the other hand, begin on the inside of the tree at the heartwood then erupt outwards through the bark. In fact, the dense sterile mass of mycelia includes decayed bits of birch tree tissue. This means chaga brings forth many of the healthy benefits associated with birch trees. Despite continual efforts to grow chaga as a regular crop, the mushroom resists cultivation and must be harvested in its wild habitat. Chaga has been an important part of folk medicine in the Northern parts of Eurasia for centuries. Siberians prized the mushroom as a cleanser and natural detoxifying properties, also they used chaga to support many other aspects of good health. 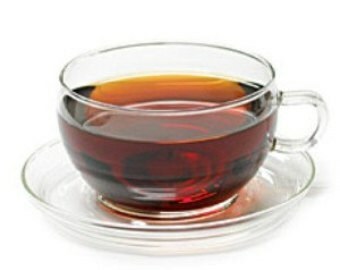 Many ingested chaga tea as a natural way to calm an upset stomach, for example. The earliest people in those faraway regions drank chaga tea for its delicious flavor and because they knew it to be a healthful beverage. Hunters and foresters drank the tea to curb hunger, clarify thinking, and stimulate energy so they could continue working in the harsh Russian environment. It supports general wellbeing and aids in digestion. 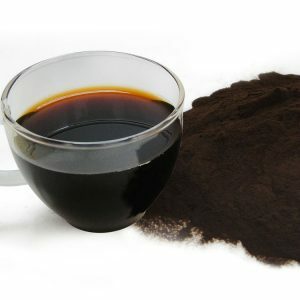 Chaga even stimulates internal cleansing, a process now referred to as detoxification. To use chaga, someone would use an ax to knock the sterile conk from the tree. Next, he would remove the black outer skin then mix the yellow-colored inner parts of the mushroom with boiling water to make tea. Any leftover pulp was used as a poultice, spread on wounds to reduce the risk for infections. Eager to harness its health and wellness benefits, early Russian scientists brought chaga mushroom samples into the laboratory. Notable German chemist J.G.N. Dragendorff studied chaga’s chemical composition in 1864 but was unable to unlock the secrets of this healthful mushroom. 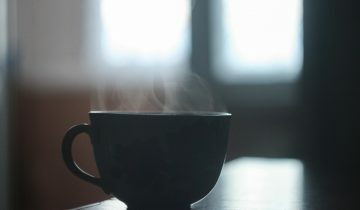 Substantial and rewarding research began in the 20th century, when scientists like P. K. Bulatov, M. P. Berezina, and P. A. Yakimov delved deep into the potential uses for chaga. In 1967, A.N. Shivrina learned compounds inside Inonotus obliquus had strong bioactivity, which means the consumption of substances inside chaga mushroom have a great effect on the human body. The healthful properties of chaga remained a secret in the West until 1968, when Alexandr Solzhenitsyn publish his book Cancer Ward, in which a country doctor in Russia described chaga health supporting benefits . While the novel was more autobiographical than non-fictional in nature, it enlightened Westerners about the positive benefits of chaga. People all over the world now know about the health benefits of chaga mushrooms. Even as scientists investigate the therapeutic potential of chaga mushroom, consumers already clamor for chaga benefits. With the help of modern technology, chaga is now available as chaga tea, chaga extract and chaga raw, which is chaga in its natural raw state. Short of traveling to Canada or Siberia to pick the chaga mushroom from a birch tree, chaga raw is the most direct way of getting chaga in its purest, most natural form. Raw chaga comes in chunks and powder. Similar in consistency to mushrooms taken directly from trees, chaga chunks are exceptionally pure. Chaga chunks break easily into small pieces or ground into a powder. 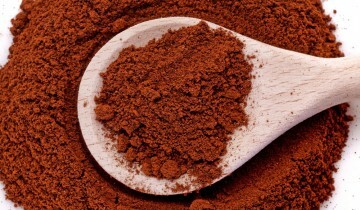 It is now easier than ever to enjoy the many chaga benefits from this unassuming mushroom. Advanced technology now makes potent chaga extract possible, while global shipping makes fast delivery of chaga raw and chaga chunks possible to the far reaches of the planet. Today, everyone can optimize personal health and wellbeing with chaga. Chaga is rich in antioxidants, which are substances that may inhibit oxidative stress and prevent cell damage. Packing more antioxidants than even acai extract, the smooth, smoky taste of a chaga tea makes it easy to get this essential nutrient. Everyone feels stress at times – mentally and physically. Some manage it better than others, but long-term stress can build up, taking its toll on your body health and mind. Chaga mushroom can unlock the way to serenity and well-being. 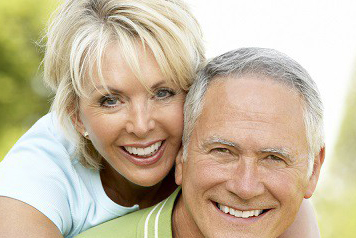 At Chaga Natural, we take great pride in providing you with all-natural, wild-harvested chaga. As a leader in wild harvested quality chaga products, you can trust our experience and dedication to your health to empower your journey into wellness. Product is excellent. We have been making pots of tea to keep cold in the fridge for drinking. So far I have only used on chunk of Chaga Natural and don’t regret it. Thank you. I will be ordering again. This is a great product. I enjoy it as a tea and notice a difference after just a few uses. This is my new go to. Thank you. I love Chaga Natural products, they ship fast and the chaga extract really works! This is an excellent health tonic for my immune system. I will be ordering again. We are very much interested in improve body immunization and ordered three types of Chaga mushrooms - from Canada, State of Maine, and Siberia. This one is from Siberia and so far shipment, excellent instructions, best customer service. I love this one. Strongly recommended. Easy to drink!